Low cost, high performance kukri for completing your knife collection! 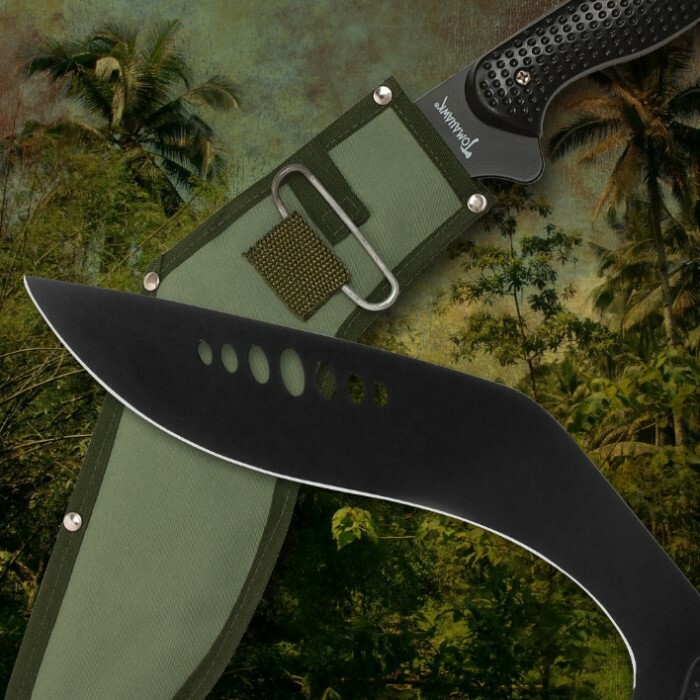 The Kukri is a Nepalese knife originally used to clear wooded areas. It was later used as an effective weapon due to its curved design. The curve enables the user to create more force when wielding the weapon. 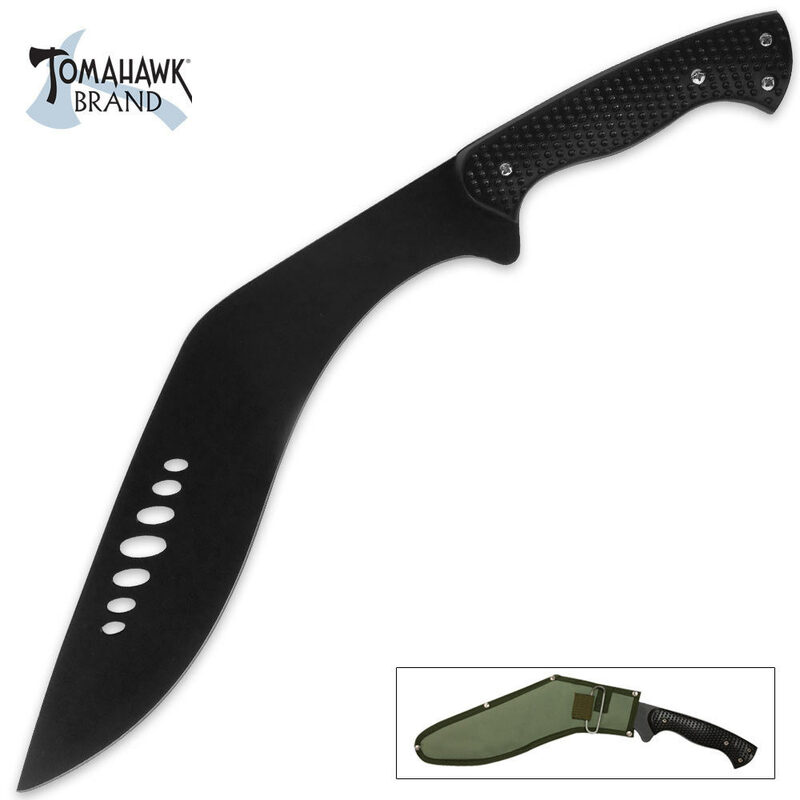 This full tang Kukri is 19 1/4" in length and includes a nylon sheath. Please note: Current stock of this item comes with an unsharpened blade. The edge tapers but has not been honed sharp by the factory. I've always wanted a kukri, and this piece immediately caught my eye. But with all of the reviews I've read on this so far, I played it safe and got it in a BOGO sale. Of course, the sheaths are crap, but I was able to reinforce them using duct tape and cardboard pieces. To be fair, most sheaths from most sellers are crap. As for the blades themselves, they actually feel pretty solid. They both arrived nice and sharp out of the box. As far as durability goes, I hacked up a wood pallet pretty nicely. Cutting in "v" patterns, it chunks out pieces of wood really well for what you get. The blades are thin and it feels like it can bend if given enough force. I have mixed feelings on the handles. On one hand, the plastic grip is easy on the hands when swinging the blade around, and the studs are held together by philips heads, making maintenance and customization much easier. On the other hand, the plastic grip feels hollow, like it will crack/break if you swing against something hard enough. Again, like the sheath, you can always reinforce it yourself, like duct tape or electrical tape. I feel like it'll come to that eventually anyways. If used for the right application, and with the occasional modifications and maintenance, I feel like this will be a nice durable blade for many uses to come. Now that I finally have it, I'm starting to suspect that a majority of these 1-star reviews came from people that actually tried cutting a tree down with this. I don't know what you guys were doing with this kukri, but hey. This is why we can't have nice things. This is a toy. It didn't hold up to 10 minutes of clearing brush. The edge ended up looking like poor excuse of a serrated blade after the nicks and folded edge from hacking 1" diameter gum and oak saplings. Worst machete I've ever owned. I usually have good luck from Budk, but this one was rough. The handle was loose when I received it, got a replacement, same thing. The blade is wafer thin, the machete could barely cut through tall grass. Don't get it. Budk, please stop selling this one, you can do better! It's crap ! Got mine free, wish they would have kept it. Crap is crap ! Can't even let kids play with it, too weak ! Save your money. I got mine as a free gift for my order. I was pleasantly surprised at the sharpness of the blade. I have not used it on anything heavy, but I felt that the blade was substantial. Junk blades the blade is flimsy and bends way to much and is not sharp at all. just a curved butter knife. only bought them because it was the 2 for one deal supposedly.